Shadows Over Camelot: We played this twice--once as a learning game without a traitor for 3 new players, and a second time as a real game. For the real game, we shuffled only 6 loyal cards plus the traitor. From the learning game, everyone understood what a traitor might do. The cries of "traitor!" were flying around the table in jest at every suspect action. Near the end of the game, I had my suspicions narrowed down to 2 players, but did not have enough evidence to accuse. The party was defeated by evil, and the real traitor was none of my choices! He observed that the party was doing poorly enough that all he needed to do was pretend to over-react to every situation, and simply waste time moving around rather than actually help any quests. I suppose we attributed it to being new. Let him try that again! Everyone had a great time with this one. Manila: I had just played through a solo game the day before, but was eager to teach it. 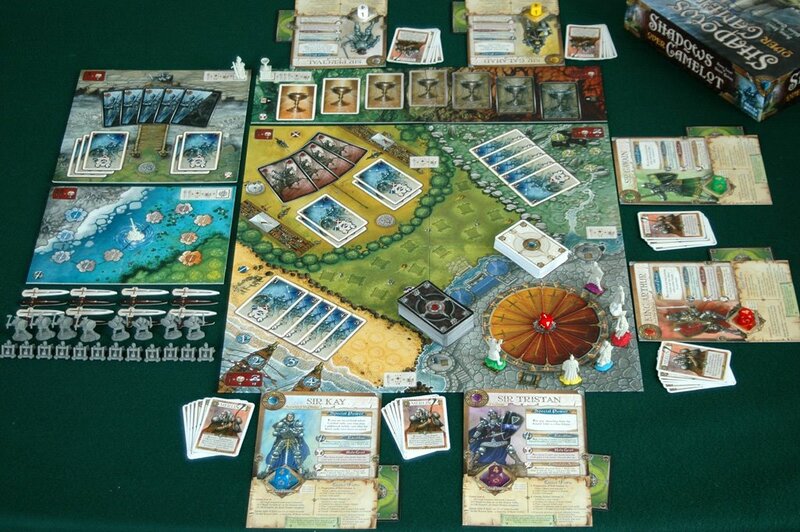 Manila is rather mechanics heavy, and the disorganized rulebook doesn't help either. Being the only one who knew anything about the game, I was also the only one willing to bid up the Harbor Master on turn 1. I bought a share of nutmeg, and ended the round with only 7 pesos. No one was quite sure what to think of my actions. I passed up the HM on the second round and played conservatively to accumulate some cash. As the values of goods increased, players started to catch on that buying a share is very important. By the third and fourth rounds, the bidding became more intense. Players were also seeing the subtleties of where and when to player their workers. More than once, cheers (and groans) erupted as the dice sent the punts to Manila or to the shipyard. Overall, a very good time. It was so-so for one player. Did I mention this game has the coolest freakin' coins? Masons: With game day over, I went back to playtesting some of my newer games. I had Masons on the table when Mary Ann walked in. "Ooh! Let's play that!" You don't have to ask me twice. The mechanics are very simple. The cards take a couple of times to get used to. More than once we got the "outside of all cities" property backwards. Undo! Undo! I was worried just a little by all the talk on BGG about the randomness. Sure, there are cards worth more than others at any given point, but that didn't bother me at all. There is so much mitigation potential in this game. I just loved it. Some cards have fixed value(s), so you use them when/if their conditions are met. Some are worth more early on, and some are worth more later. If you hold on to the former too long, or player the latter ones early, that's your own problem. If you have mediocre cards, choose not to score, discard one, and draw 2 new cards. Then you will likely be in last place and can get rid of a bunch of cards you do not like. I think the randomness in Masons is perfect for a light game. 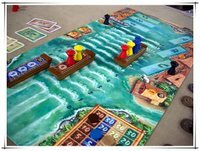 Kreta: The next day I was playtesting Kreta, and again Mary Ann walked in and wanted to play. "Remind me to setup new games more often," I said. Kreta is a fairly elegant design. Even with the German names on the cards, it only takes about 2 scoring rounds to understand what they all do. The (translated) rules are not the best in their explanation of provinces with 7 figures, or the use of Abbots, but overall are good. Kreta is a very fluid game. 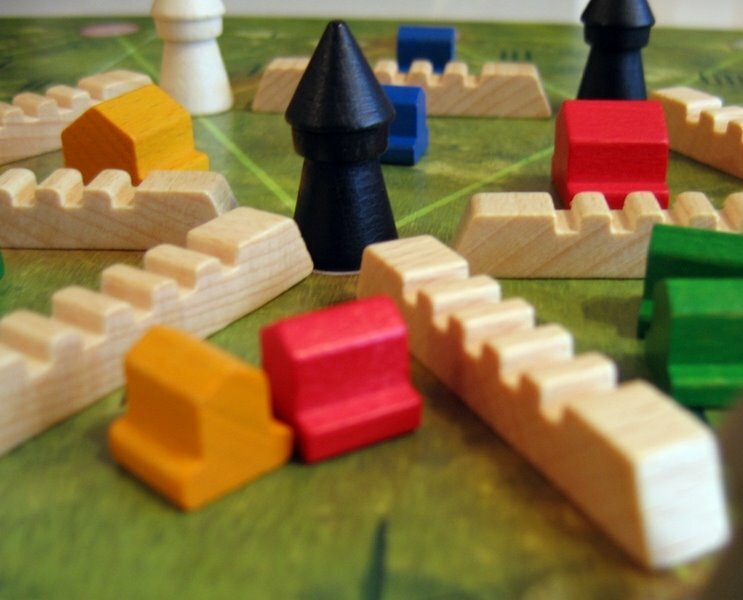 As the current and subsequent scoring locations are competed for, players shift their Villagers, Abbots, and Ships around the board, and agonize over building fixed Villages and Forts. The power of scoring (playing the Kastellan card) is somewhat balanced by the fact that it costs you a turn. I think I triggered scoring 8 of the 11 times. My early lead of about 9 points slowly eroded. The game came down to the timing of the final scoring. I could have scored for a tie, but chose to use the Feldherr (Commander) card to move 3 Villagers into the scoring provinces. Mary Ann could not counter this to keep the tie going. Again, we had a blast. Overall, a great series of games, and a lot of fun for all. I'm looking forward to getting more of my newer games out. Oh, yes, Manila coins are great! Maybe they all look the same, but they just look so real, like they've been in circulation for a while... You don't get that feeling from the shiny coins in most games. I too like Kreta and Masons. I have been fascinated by the amount of control you really do have in the game, relative to how much I it looks like you ought to have. So intrigued even that I bought the game - something I don't often do. Kreta was a similar story. I had been playing Web of Power on some website against some AI, it was neat to learn the game, but I am not a huge fan. At BGG.con I played Kreta, and was pleastanly suprised to find it a lot like Web of power, but you get to move your guys around. 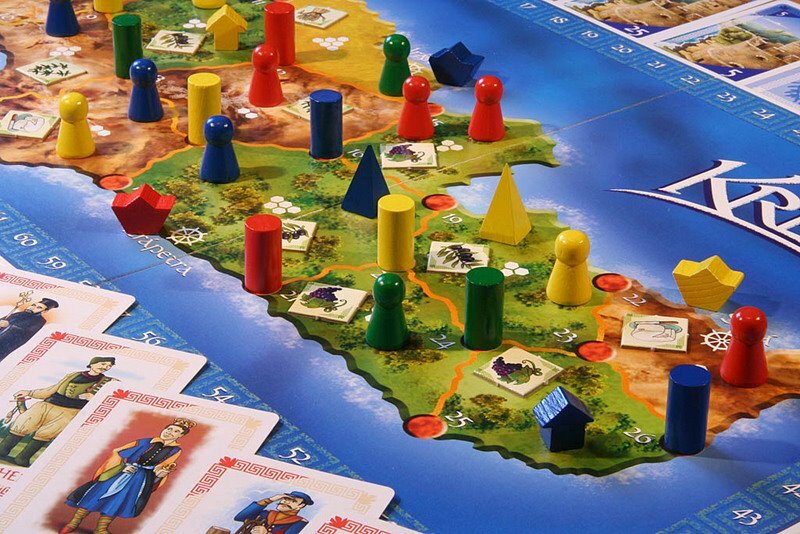 Kreta was my second favorite game at the con, and someone was nice enough to sell it to me on the spot. Seth, what was your favorite?